Swanky Digs: Does anyone else remember this book? This was one of my favorite books as a kid. In fact, it was this book that first triggered my interest in architecture and interior design at an early age. Without it maybe I'd now be a dentist or something! I was just thinking about it today and did a little googling - it looks like it may be out of print. My copy is still at my parents' house. I believe the book technically belongs to my sister, but she became a social worker and I’m the designer so it clearly had a much greater impact on me (and therefore really should be mine). 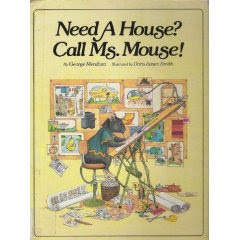 It is the story of Henrietta Mouse - “a world-famous decorator” who designs homes for all her animal friends. The illustrations used to just fascinate me. If you can find a copy I highly recommend it. Read the New York Times book review (from 1981!) here.